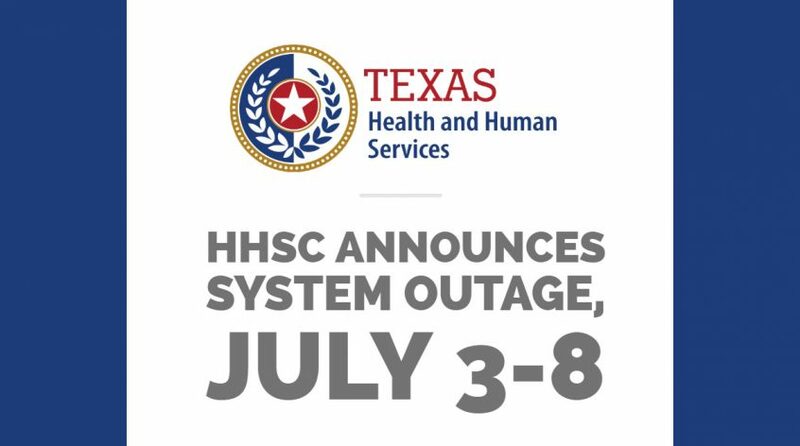 Attention Texas Providers: Texas Health and Human Services Commission (HHSC) has announced a planned system outage, July 3-8, 2018. From 6:00pm on Tuesday, July 3, until 7:00am on Monday, July 9, all HHSC applications related to Texas LTC providers and processing will be unavailable as HHSC updates various hardware and software systems. This outage will affect all SimpleLTC customers using SimpleCFS™ for Texas Medicaid forms submission, as well any providers using the Texas Medicaid & Healthcare Partnership (TMHP) LTC Online Portal or TexMedConnect. What do SimpleLTC customers need to know? TMHP has asked for SimpleLTC’s help in limiting forms submissions to the TMHP system during this time. Therefore, we are asking customers to please only submit Texas Medicaid forms that are date-sensitive and require submission between July 3–8. This will help minimize delays after the HHSC system becomes available on July 9. What will TMHP/HHSC do during the downtime? MESAV: On July 3, 2018, HHSC will complete normal daily processing of form and assessment data received from the TMHP LTC Online Portal. Processing resulting in updates to an individual’s MESAV will be sent to TMHP on July 4, 2018. Due to the lack of form and assessment processing by HHSC, MESAV data will not be updated during this window. However, claims for LTC services for which a service authorization already exists on MESAV may still be submitted to TMHP during this time. MDS/Medical Necessity: TMHP will continue to receive MDS assessments as scheduled and will process Medical Necessity determinations on completed MDS Assessments. 8578/PASRR: HHSC will continue to review 8578 Intellectual Disability/Related Condition Assessments for Level of Care and Level of Need. Likewise, Authorization Request for PASRR NF Specialized Services will continue to be reviewed by the HHSC PASRR Unit. However, no form or assessment data submitted on the TMHP LTC Online Portal after 6:00pm on Tuesday, July 3 will be sent to HHSC for processing until after the outage is complete. Statuses of these forms and assessments will remain “pending” (Medicaid ID Pending, Pending Medicaid Eligibility, Pending Applied Income, etc.). Fee-for-service claims: Fee-for-service claim adjudication and payment will function as normal. Claims for services covered by managed care will be forwarded to the appropriate MCO. Holiday closure: HHSC LTC Provider Claims Services will be closed on Wednesday, July 4, in observance of Independence Day but will otherwise be available during normal business hours to take calls during the outage. Staff will have limited research capabilities and no update capabilities. TMHP system availability: Normal business processing is expected to resume the morning of Monday, July 9, and updates to MESAV should begin Tuesday, July 10. If you have questions, please contact TMHP at 800.925.9126 or the SimpleLTC Support Team.